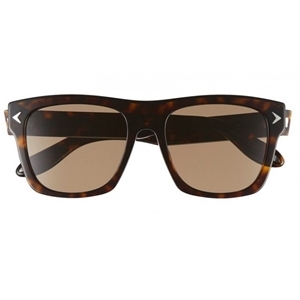 THE GIVENCHY GV7011/S O86E4 IS A DARK HAVANA OVERSIZED ANGULAR WAYFARER. The sunglasses have the fashionable oversized look, and are a statement piece favoured by fashion editors worldwide in a classic wayfarer look. The frame looks great on the streets or on the beach and being oversized graphic style hide who or what you are looking at whilst be extra protective.